So I haven’t been posting as much as I’d like to. For that, I’m going to blame a guy named Marcus Gunn. Okay, I actually can’t blame Marcus Gunn because he discovered this ptosis that has plagued my daughter since birth and baffled every single doctor we’ve seen. My youngest daughter has been a handful since conception. Fertility treatments to even get pregnant with her, combined with a difficult pregnancy then a birth and aftermath that had me close to meeting my maker and I knew my little hurricane would keep me on my toes forever. One of the things we started noticing about Youngest since birth was that when she yawned, cried, or sucked, one eye would get bigger and pulsate while the other got smaller. We asked our doctor about it in North Carolina and he referred us to an eye specialist, but then we moved to Texas so we waited. But finally saw an eye doctor who said she thought it was just habit at this point and she’d grow out of it. So we didn’t worry for a while. Then during preschool, one day she came home and told me it hurts when one eye gets bigger and smaller. So we went back to the eye doctor who referred us to a pediatric eye nerve specialist in Dallas. Turns out there’s a nerve that goes from your eyes to your jaw and This disorder is also referred to as “Inverse Marcus Gunn Phenomenon”. Oral-Facial-Digital Syndrome is a rare genetic disorder. In patients with Type III of this syndrome, upon movement of the lower jaw, the eyelid involuntarily and rapidly raises, causing the eye to open wider. (Referenced from here where you can also see photos and read more). I asked if he could fix it and he said it’s not something that should bother her and we’d keep an eye on it if it actually does hurt or she’s just noticing it. Because another problem with this (more on this later as well) is that it’s considered cosmetic so it wouldn’t be covered by insurance even if we did want to get it fixed. We’d have to fight it. Just like what happened next as the doctor pulled out some little magnifying glasses and measuring sticks to tell me her eyes were out of alignment and that she’d need eye surgery. He showed me where her eyes didn’t line up, something I’d always noticed with her “crazy eyes” and we always thought she was doing it on purpose. So I reluctantly agreed to surgery and then went to check out, paying an amount that made me cringe since we hadn’t met our deductible then told we had to get this all approved by our insurance before they’d call us to schedule surgery. Yeah. Insurance rules the world. We didn’t know how much they’d cover if any since there’s a fine line if eye surgery is considered cosmetic or needed. IE LASIK was considered cosmetic so I couldn’t get that covered. So then we waited for a call from the scheduling office, which of course gave us more time to look up strabismus surgery and Marcus Gunn and for me to worry. 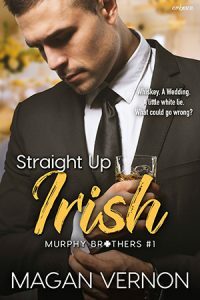 At this point, I was in between deadlines for Irish on The Rocks and Love Like Crazy, trying to work while wondering what was going to happen next and when we’d get the surgery scheduled. Not to mention that both my kids were in softball so every night was spend at a game or practice with them as I tried to work and hope no one got hit in the face with a ball. Finally, the doctor’s office called to schedule the surgery the Friday of Memorial Day weekend and said Insurance would cover 90 percent but we also hadn’t fully paid our 5K deductible. Also, it should be noted, in the middle of all of this, my dryer broke TWICE. We had a repairman come out to fix it TWICE because with newer dryers it’s harder to do on your own. After the second time, and I wrote another check he advised to look at getting a new dryer if it broke again. This was when my husband and I sat down and talked about expenses and my writing job and decided I’d take a break from traveling to signings and focus on getting the books out there. This is also why I used the money to hire a PR firm to help so I could write (when the kids let me) and try not to worry about everything else while I stayed up on a deadline, taking breaks to look up surgery information. Then, finally, surgery day came. We had to leave for Dallas at 5 am, dropping my Oldest off with the neighbors to get on the bus. Youngest had her new Star Wars pajamas on and was excited to eat ice cream afterward. Until they gave her medicine and told her she had to take those pajamas off for surgery. There was crying and more screaming when they had to wheel her back for surgery, so of course, I tried not to break down until we were in the waiting room for the longest fifteen minutes of my life. Then the doctor came out and told me to breathe. That she did perfect. We were able to go back and see her again after about twenty more minutes where she cried and told me it was ‘ouchie’. So I held her in my lap while she ate a popsicle then napped the entire car ride home. Most kids are tired all day or just want to lay around. My Youngest is a GD superhuman. I had to yell constantly for her to stop rubbing her face in the dog’s fur or to stop jumping on the bed. We were told she’d be tired and not want to eat. NOT MY KID. She also ate about five pieces of pizza and kept trying to play with rocks in the yard (you know when they told us not to let her play in the sand!). It’s hard to keep her down even when I see her squinting and I force her to turn off TV or put on sunglasses. But it’s been the biggest relief, after our post-op, to know that everything went perfectly. You know…until more bills come in. Which is why this last week, between surgery, I managed to finish two more books to get out in June and September. Between all the sleepless nights it’s all led to a happy, healthy little girl with a “magic eye” as we like to call it. She’ll start kindergarten and we know other kids may mention her ptosis, so we’ve had a lot of talks about it. But I know, I’ve done everything in my power to make sure she’s happy and confident. If that means I put aside work until she goes to bed to get a book done, I do it. If it means writing and keeping a work at home mom job so I can be there for surgeries or whatever else curve balls life throws at us, I do it. 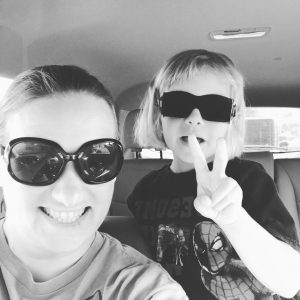 It’s not every day I can be supermom, but I hope my kids at least think I’m cool enough to try. Wow. Just wow. So glad they figured it out and they took care of it. Now time for Mom to take a girls trip with your favorite friends and forget about life for a few days.